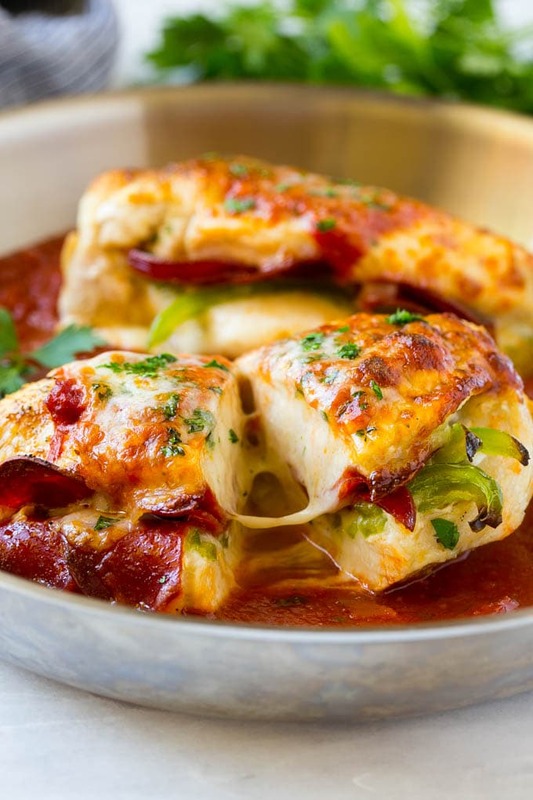 This pizza stuffed chicken is loaded with pepperoni, bell peppers and plenty of cheese, all topped with marinara sauce and baked to perfection. The perfect easy weeknight dinner! 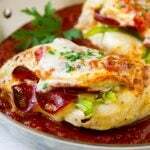 Pizza stuffed chicken is fun recipe that brings the flavor of fresh baked pizza to a chicken dinner. It is one of my family’s favorite ways to eat chicken. Some of my family’s other favorite chicken recipes are slow cooker chicken cacciatore and bacon wrapped chicken. My kids would eat pizza for every meal if I let them. Typically I make a homemade pizza crust and we add a variety of toppings, but this time around I’ve switched it up and put pizza toppings inside of chicken breasts. This pizza stuffed chicken ended up being a huge hit! It’s actually quite easy to make too, no fancy techniques or advanced knife skills needed here. How Do You Make Pizza Stuffed Chicken? This recipe starts with chicken breasts. You’ll want to look for chicken breasts that are thick enough to easily be cut in half lengthwise. To prepare the chicken for stuffing, you’re going to cut a pocket into one side of the meat. You’ll want to make the pocket big enough to stuff it full of pizza toppings, but be sure not to cut all the way through to the other side. You can watch a demonstration in the video below. Next comes the fun part…the pizza toppings! I went with a simple combination of pepperoni, green bell peppers and mozzarella cheese. Other great options would be cooked crumbled sausage, sliced olives, sauteed mushrooms and onions, pretty much and pizza topping you can imagine. After the chicken is stuffed, I use a few toothpicks to close up the pocket so that the filling doesn’t come out during the cooking process. You may have a little bit of cheese leak out and that’s totally fine and normal. I sear the chicken breasts to golden brown, then top them with marinara sauce and cheese before they go into the oven. After the chicken is cooked through, remove the toothpicks and serve. 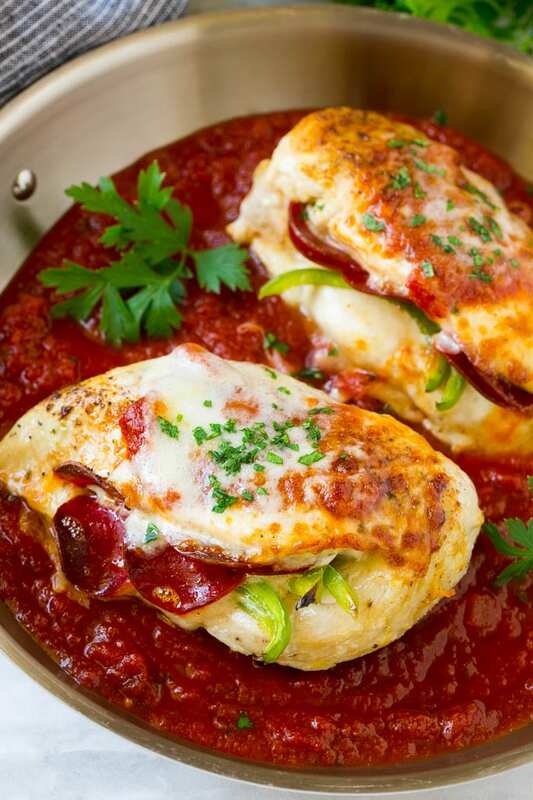 I like to serve this pizza stuffed chicken over spaghetti or on a bed of orzo pasta. Regardless of how you serve it, it’s sure to be a hit with both kids and adults alike! Using a small knife, cut a pocket into one side of each chicken breast. Do not cut all the way through to the other side. Place 5 slices of pepperoni, 1-2 tablespoons of sliced peppers and 1-2 slices of mozzarella cheese into each pocket. Amounts vary depending on the size of your chicken breasts. You may have to cut the cheese in half to fit. Reserve 4 slices of cheese to top the chicken with later on. Use 3-4 toothpicks to close up the pocket on each chicken breast. Heat the olive oil in an oven safe pan over medium high heat. Season the chicken with italian seasoning, salt and pepper. Place the chicken in the pan and cook on both sides until golden brown, 4-5 minutes per side. You may have to work in batches depending on the size of your pan. Place all the seared chicken breasts in the pan and pour the marinara sauce over the top. 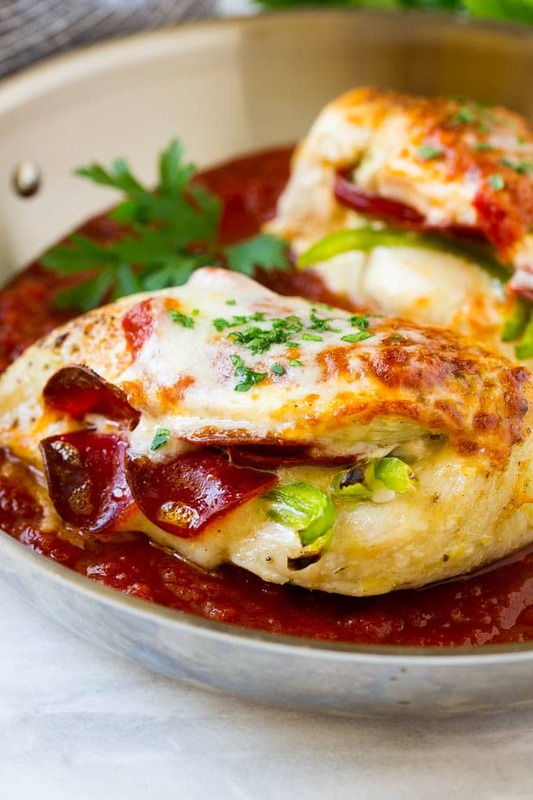 Place a slice of mozzarella cheese on top of each chicken piece. Bake for 20 minutes or until chicken is cooked through and cheese is melted. Sprinkle with parsley and serve. We eat a lot of chicken in this household too, and this looks amazing! I know my pizza loving son will love this!! Will be making it soon, and the one with bacon as well. 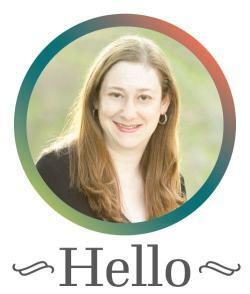 Thanks for some new ideas! Hope you enjoy, this is one of my all time favorites! Love it! So tasty! And it’s like my favourite pizza toppings all in one! Oh yum! We are pizza fans and this looks like such a fun dish and family friendly. Such a great kid-friendly meal!! Wow! This looks like a wonderful Gluten Free pizza fix for me (I’m a recently-diagnosed Celiac) and the whole family can enjoy it- I can skip the noodle part for me and just enjoy the chicken on its own. =) Thanks for the recipe!